Marv Albert: "Hello, folks. Marv Albert here with our NBA broadcast from beautiful Charlotte and ... Hey, wait a second! Give that back!" Larry Johnson: (grabs headset and places it on his head) "Hello, folks. Welcome to our NBA broadcast from beautiful Charlotte. I'm Larry Johnson, and I'll be bringing you tonight's game." MA: "Larry, please. We're in the middle of a telecast here." LJ: "Marv, settle down. America is ready to hear from me, the first pick in this year's NBA draft, the most stylish dresser in North Carolina, the teal sensation, the man with the smoothest voice since Barry White. ... And let's look at tonight's matchup between the Charlotte Hornets and Patrick Ewing's New York Knicks." MA: "Larry, aren't you supposed to be playing in this game?" LJ: "Don't worry about me, Marv. I can do both. All while dressed in this shimmering suit, construction- paper tie and plastic jewelry." MA: "But, Larry, play-by-play is my job. Your team needs you." LJ: "Keep your pants on, Marv. (snickers) Now let's get to the game. Here's the tip. Hornets' ball. 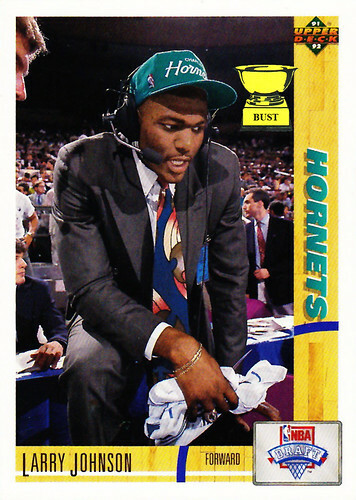 Bogues passes to Larry Johnson, who's dressed in a sophisticated suit. Johnson dribbles left. He fakes right. Johnson penetrates, elevates and dunks over Ewing. Yeeeees!" MA: "Hey, that's my line."